The most complete plugin solution for geotargeting content in WordPress! Geotargeting Pro is the favourite plugin for affiliate marketers for their country specific offers because of it's simplicity and powerful features. Now with premium accuracy to help you target States and Cities specific content. What parts of my website can be geo targeted ? I'm a seller, Can I show or hide products to users based on their location? Yes! Geotargeting PRO it's compatible with WooCommerce and Easy Digital Downloads but can be used with any other Commerce plugin that use posts types for products. You can remove the product entirely or display a message saying that is not available. Some other features worth to mention. With a powerful shortcode generator you will be able to show different content on your pages. Easily wrap your content using the built in shortcode generator and choose desired options. Every widget in your site can be geo targeted. Once the plugin is activated new fields will appear on your widgets. 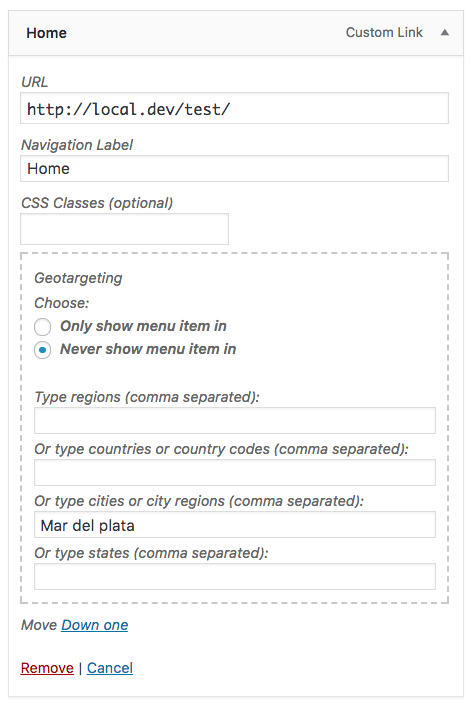 Geotarget individual menu items or use php functions in your header.php template file to geo target entire menus. You need to use page cache on your site? We got you covered with the Ajax mode! Once the page is rendered the plugin will create an ajax call and update the geo targeted content. 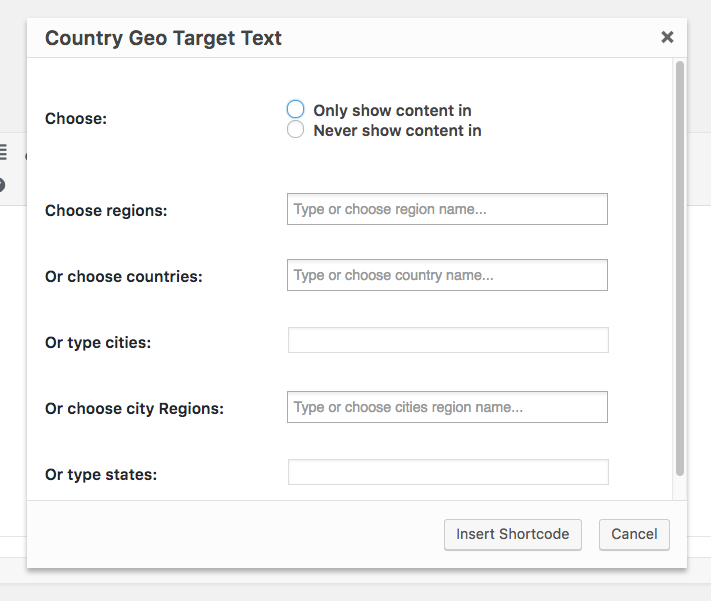 Geotargeting plugin brings a powerful PHP API that will let you geo target your content directly on your templates. It’s also compatible with the Advanced Custom Fields plugin (acf 4 and acf 5 pro). The code is clean and organized with hooks and filters everywhere. Do you need geotargeted popups? Check our Popups Premium plugin. The most versatile plugin in the market and it's fully compatible with Geogargeting PRO plugin.